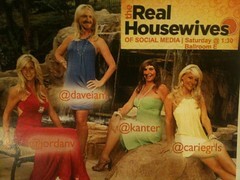 I had a lot of fun doing a panel with colleagues Jordan Viator, Carie Lewis, and David Neff called "The Real Housewives of Social Media." Our task was to present practical and tactical information about social media using metaphors that related to housewives. You can see the full slide deck here. I took measurement and since David Neff wore an apron and talked about kitchen tools and recipes, I riffed on cooking measuring techniques. Jordan Viator decided to photoshop us and create flyers to promote our session. I'm still laughing. 1) Measuring Cup: Identify the right results and pick the right metrics to measure it. 2) Egg Timer: Track your time because working on social media can give you ADOLAS (AD - oh look a squirrel!) If you track you time and have specific tasks, you know what you're getting for your time investment. It's just one step away from looking at ROI. 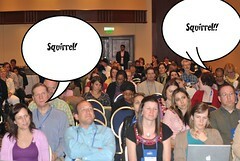 I had a funny picture of a Squirrel and shouted out Squirrel at random points during the presentation. This started a twitter hashtag #squirrel. 3) Funnel: Measure the whole funnel! I shared some learnings from my Birthday fundraiser on Twitter and Facebook. I talked about the importance of finding influencers at the first step and shared a few tips and tools. I shared some thoughts about using Social Network Analysis tools to analyze your Twitter network. 5) Seasons To Taste: This was a point about actually looking at your data to reap insights. What are your measurement tips and tricks for nonprofit social media? ok... what's with the squirrel? It's killing me. Love the metaphor... Can you expand a little on your A/B testing with your Facebook page in a future post? Inquiring minds want to know! I wish that I would have caught this session because one presenter (I won't say who) kept yelling out "squirrel" during her session at AFP 2010, which I found extremely distracting...not that she did not have some valuable information in her presentation, but still, the squirrel bit was annoying in my opinion. I have a feeling that yours was more effective. On the metrics side, I agree with the previous comment and some points you have made before. Keeping follower counts, comments, etc in mind is all well and good, but engagement ratios, share of voice, and other relative measures are better measures of effectiveness, success, etc. Ah that's funny - hopefully the other presenter gave this attribution. I only yelled it out once - in the context of using your time wisely while on social media! The squirrel reference comes from the movie UP - the add dogs that run off after squirrels. Focusing on metrics through a kitchen analogy was perfect. It really helps break down the key points in a more concise and clean manner. The squirrel bit made me laugh. 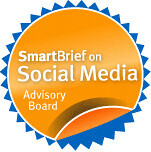 which offers some good insight and advice on how to navigate through social media trends. It's interesting how you likened the tips to the kitchen tasks of a housewife. It makes reading it all the more fun. Social media can be such an effective marketing tool as long as it is practiced properly.